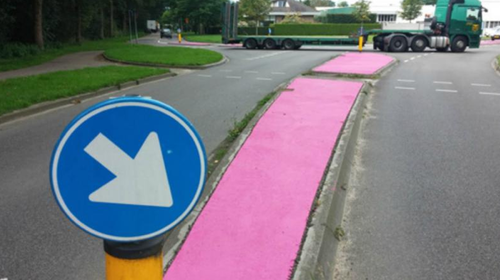 Today while I was browsing dutchnews.nl (an English speaking news site), I read about a mistake which ended up bringing good attention to a Dutch town called Wijchen — the town council ordered more paint for the traffic islands but mistakenly used the wrong color code on the order form. The result? Pink traffic islands. When I first read the article, they said the mistake would be corrected next week as it might otherwise might be a distraction. However, due to the public liking the accidental color choice, the news article was updated to state that the color will stay.